Tai Chi (Taiji) long saber. Same as the Tai Chi Dao but with a longer blade and handle. Some Tai Chi styles use this saber, with S guard and ring pommel. The guard is made from two laminated cross grained pieces of hickory and is 1″ thick for strength. 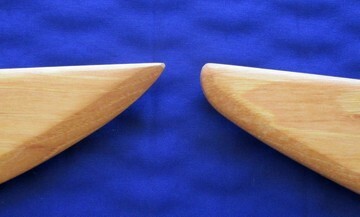 Blade width – 1.5″ at the guard. Avg. POB – 5″ to 7″ from the guard. Avg. weight – 1.5 lb. to 1.9 lb. Blade length Choose an option34"35"36"37"38"39"40"
SKU: 133. Category: Dao. Tags: Tai Chi Broadsword, Tai Chi Chang Dao, Tai Chi Long Saber, Tai Chi Saber, Taiji Long Saber, Taiji Saber.